So you’ve made it to the big city. Surrounded by breathtaking architecture, nightlife, dining, and… bugs? There are actually more bugs in cities in rural areas. Scientists think that there are so many bugs in cities because cities tend to be hotter than the rural areas around them. Luckily, there are a multitude of different ways to deal with bugs when you’re living in the city. According to research gathered by Insight Pest Solutions, the most problematic bugs in the Greater Boston area are ants. 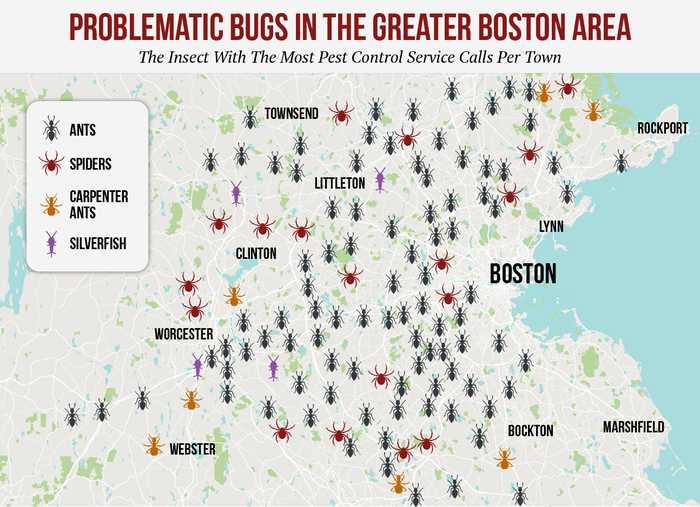 This graphic shows the insect with the most pest control service calls per town. There are two phases of handling bug problems, prevention and action. In order to prevent bugs from taking over your apartment or home, especially during the summer months, keep your eyes peeled. More often than not, insects such as ants and cockroaches send out “scouts” to scope out your home. Try keeping branches and shrubs well groomed away from your walls, so bugs don’t make the natural transition from their home to yours. Cleanliness is also imperative. Everyone loves the taste of a cool glass of lemonade or a ripe watermelon on a hot summer day- including bugs. Keeping your apartment clean is the best way to prevent bugs from infiltrating. Cleaning kitchen surfaces with lemon juice or vinegar removes scent trails that bugs follow. Also, keep fruits and vegetables in the refrigerator. If the damage is already done, and you’ve found yourself with a new batch of insect roommates, don’t fret. The first step is to identify the type of pest you’re dealing with. Once you’ve pinpoint the culprit you can start to work to get rid of them. Your lease may also have provisions for treating the building if you rent in a city known for a specific type of pest. If you rent, you should also talk to your landlord first before using any pesticides or attempting to caulk. Also, be sure your neighbors are following good practices. You’d be surprised to see how easily bugs can travel from one apartment to the next. With an action plan for prevention and a few targeted attacks against any existing pests, it is easy to keep pests under control, even in the city.